Older Americans are wary of changes to Medicare. Compared with younger people, they are more positive about the way the program operates, less apt to think that changes are needed and far less disposed towards Paul Ryan’s proposal to reshape Medicare. A Pew Research survey in May of 2011 found that those 65 and older had a negative reaction to Ryan’s plan to change Medicare: 51% opposed the plan (including 43% who opposed it strongly) compared with only 25% who favored the plan. 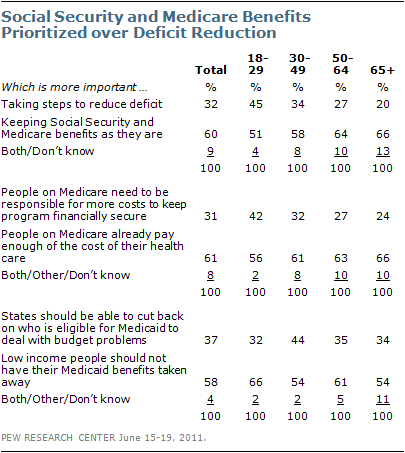 People under the age of 50 offered far more support than those over 50 for Ryan’s Medicare plan. 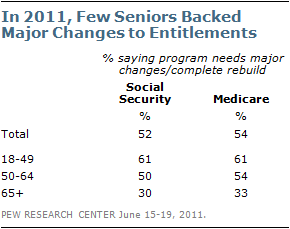 A June 2011 survey found that most seniors said they were happy with how Medicare and Social Security operated. About six-in-ten (61%) said Medicare does an excellent or good job serving the people it covers; 57% said the same about Social Security. By contrast, most of those under 65 said these programs do an only fair or poor job. The income gap among Republicans and Republican leaners is about as large as the difference between GOP supporters of the Tea Party and non-supporters. 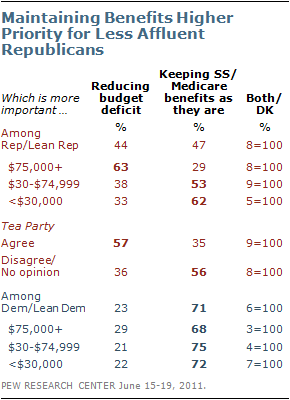 Among Republicans and Republican leaners who agree with the Tea Party, 57% view deficit reduction as more important than preserving Social Security and Medicare benefits as they are. Among Republicans and leaners who do not agree with the Tea Party, just 36% say that reducing the deficit is more important than maintaining benefits.